Its history, a chart with notes and descriptions of the apples. 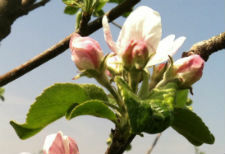 See also our orchard plus a page of links to other apple tree resources. A long time ago, on an farm in Indiana County, Pennsylvania, there was an orchard. Several years before my father, Joseph Ralston Henderson, died, I spent a lovely afternoon talking to him about the apple orchard on the farm where he grew up. When I interviewed my dad, it was more than 75 years since he had lived on the farm, and yet he was still able to remember an amazing amount of detail -- not just the names of the apples, for example, but also their qualities and descriptions. Over a hundred twenty-five years ago, my great grandfather, Joseph Henry Henderson, planted an orchard on his farm in the south-west corner of Indiana County, Pennsylvania, about 35 miles northeast of Pittsburgh, and just over the county line from Armstrong County. The size of my great grandfather's orchard was one hundred apple trees. Which nursery the trees came from, my father did not know. He thought his grandfather probably obtained his trees from a commercial traveller representing one of the many competing fruit tree nurseries in the greater Pittsburgh area selling bare-root whip orchard packages. It is also possible that he ordered the bare root trees by mail. My father tells me that ordering from the Peter Henderson seed catalog was a long family tradition, so ordering trees by mail could have been possible. 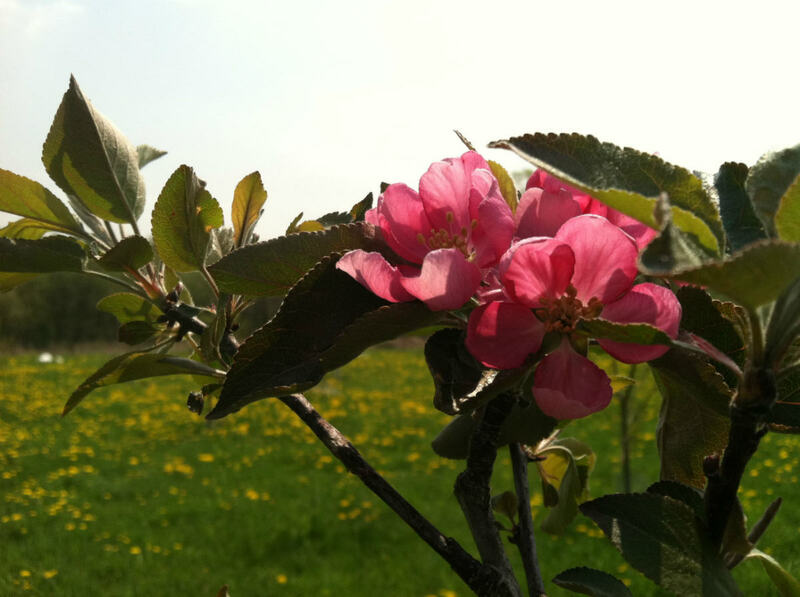 There were already a few apple trees near the house and elsewhere on the farm. One old tree growing by itself near the creek had small, bitter tasting, yellow fruit. Grandpap, perhaps in jest but certainly with a bit of contempt, called it their Johnny Appleseed tree. It was certainly possible, since Johnny Appleseed was known to have traveled in that part of Pennsylvania around the time the tree first sprouted. Johnny Appleseed did not believe in grafting, so all his trees were seedlings of unknown origins, and few were good for anything except making cider. Suggesting a tree was one Johnny Appleseed had planted was not a compliment. My Grandpap, John G. Henderson improved upon his father's original orchard, making significant changes by discontinuing some varieties, removing trees, and adding others. One of his wife's cousins, Bob Fulton, was an expert in grafting apple trees and did much to enhance and improve the orchard. Behind his own house, Bob Fulton had a tree with eleven different varieties grafted to it. 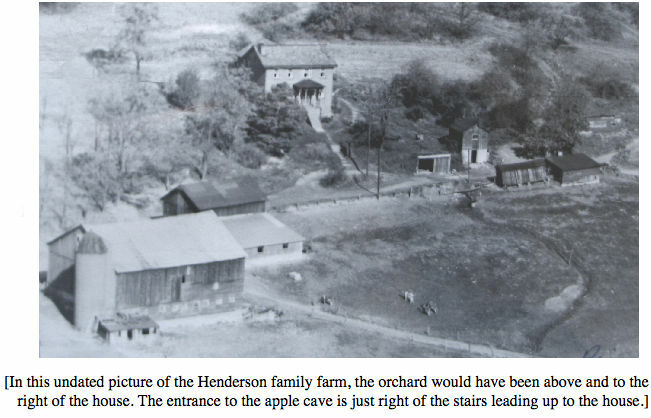 Sometime in the early 1920s Grandpap improved the enterprise by having an apple cave built into the side of a hill. It was reinforced with walls and a concrete slab for a roof. Fourteen different varieties were kept in the apple cave. There were more than fourteen varieties of apples in the orchard, but poor keeping varieties were not stored. Those that didn't sell out in their season were cooked, canned, or dried. The apple business was a family operation. All the children had apple information grilled into them so they could serve customers. It wasn't enough that they could sell the apples; each child had to be able to recommend different apples. That may explain why my dad was able to remember the details of the orchard and its apples as well as he did. Each apple variety was well suited for the Mid-Atlantic region and fit the early twentieth century standard for being commercially viable. However, each had its own special quality and purpose. 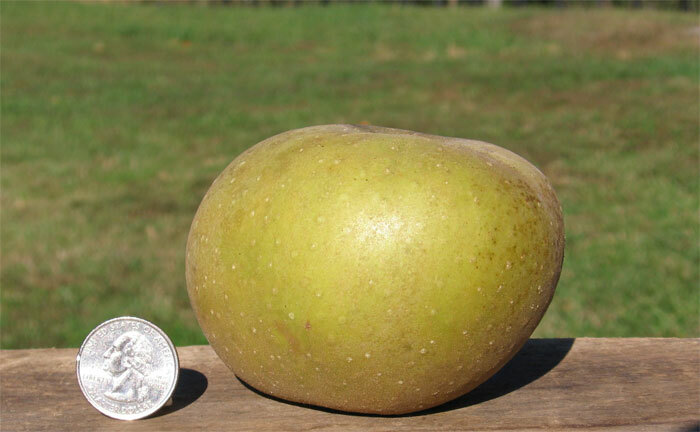 Grandpap judged the quality of an apple variety primarily on its use and keeping quality. He favored utility apples like the Baldwin that were good for both cooking and fresh eating over specialty apples good only for baking or only for eating out of hand. In the age before electricification, mechanical refrigeration, and controlled atmosphere storage, an apple's natural keeping quality was an even more important quality and there was more of a need for a succession of apple varieties from those maturing in early summer to those ripening in November. With a head for business and marketing, Grandpap certainly paid attention to flavor and appearance, as well. My grandmother had her own opinion on the apples, having some favorites for pies and others for fresh applesauce. For canning, however, it didn't matter, and for apple butter and canned applesauce she used whatever apples were in danger of spoiling. Cider-making was a big event in the fall. It was always made with a blend of apples, but the base for most ciders came from Baldwins. The orchard was probably at its peak in number of vigorous trees during the 1920s and early 30s, when my father was growing up. Apple sales were a significant source of income during the depression, supplementing the Henderson dairy operation. Apples were sold both at the farm and along the milk route. When the dairy operation was expanded after World War II, the orchard became less important, and the trees were no longer maintained. My great-grandfather and his neighbor (and cousin) Thomas Hood planted their original orchards at the same time. Cree Hood greatly expanded his father's orchard and made it his chief source of income. In 1946 my uncle Bob, fresh out of the army after World War II, bought the Hood farm, and he and his brother, my uncle Carl, spent several years and a lot of hard work trying to revive the orchard and make it profitable. They also constructed a commercial cider press. I have a faint childhood memory of a family gathering at a cider mill. What I remember most about the cider pressing is being teased about worms being crushed into the cider. One year their trees survived a frost when most other orchards in the area did not, and they made quite a sizeable profit. Another year a late frost killed off 90% of the blossoms, and they lost their crop. Realizing the uncertainty of orcharding, they both found second jobs. In December 1952, a fire destroyed the house that the brother's families shared (each lived on a different floor), and not many years after that the orchard was torn out to make more room for corn and pasture for their father's dairy farm. The apple cave still exists, although it stores things other than apples, including kegs of maple syrup. My cousin's son Greg, the sixth generation of Hendersons to farm the same land, and his wife Jessica have planted a small orchard of apples, peaches, and pears -- so the tradition continues. The list and descriptions of the following apple varieties come principally from a discussion I had with my dad, Joseph R. Henderson, on New Year's Day in 2004. He was then 89, but his memory of those apples was quite clear. He did need some prompting at times. For example, he couldn't remember the name of one favorite apple, but when I suggested King of Tompkins County, his face lit up as he said "King" and went on to describe it with crisp detail. Dad died at Christmastime in 2010, and one of my favorite memories of his storytelling (and he told a lot of stories) was that day we had our conversation about the orchard. 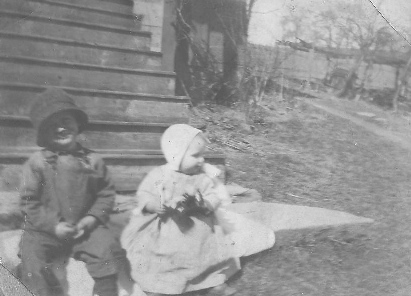 Pictured to the left are my father and his sister Martha in the early 1920s, when the orchard would have been thriving. over yellow There were more Baldwin trees than any other variety. It was the apple most asked for by name. 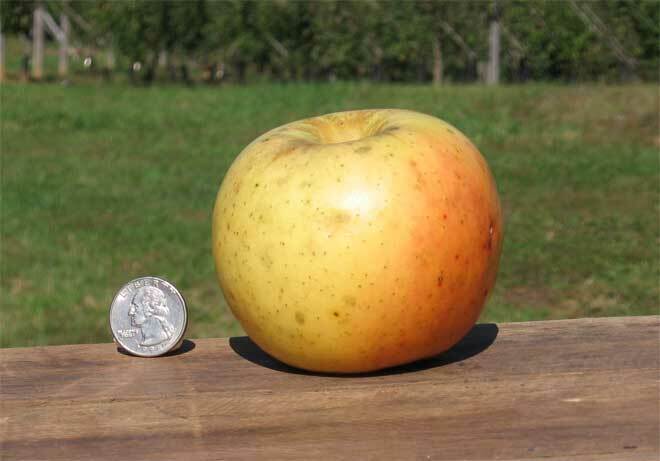 My grandpap liked the Baldwin because it had a pleasing appearance and good size, had a thick skin that prevented the fruit from bruising, kept all winter, and was the most versatile apple. It was excellent for fresh eating and good for both cooking and baking. Its flavor was well balanced between sweet and tart. Good cider was not made until the Baldwins had been picked and given time to mellow. Its biggest flaw was that Baldwin apples were plentiful only every other year. blush Not widely popular, and only one tree was grown. It had an oddly sweet flavor and strong aroma that resembled nothing like a banana. Although it ripened late, it was not one of the apples stored in the apple cave. The fruit bruised easily and didn't keep long before turning mealy. On the positve side, it was big and juicy. Even with its odd flavor (elsewhere I've seen musky as a description), it was primarily sold as an eating apple, since it wasn't very good cooked or baked. Some apples were quite round while others were ribbed. Yellow, striped & spotted with red Dad couldn't remember much more about this apple than its name. It was one of the last varieties to ripen, and it was mostly yellow. It was most likely a regional name for the "Doctor" apple that originated in Germantown, Pa. 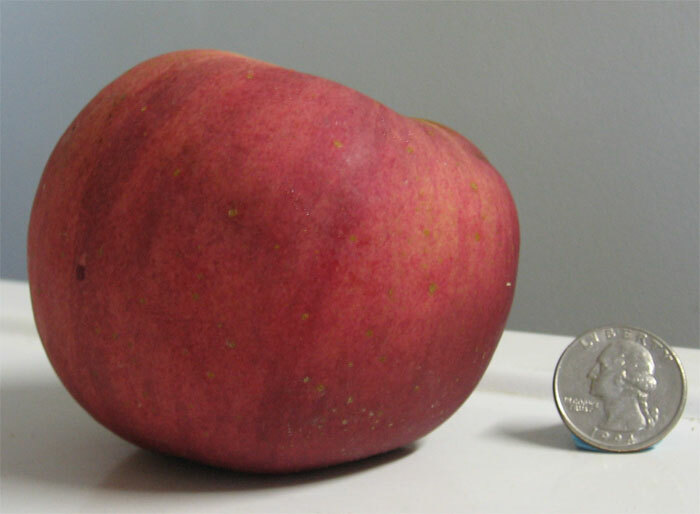 It was one of the 14 varieties kept in the apple cave. Yellow green This apple was simply called a Greening. It was most likely either a Rhode Island Greening or a Northwestern Greening, but Dad didn't know. 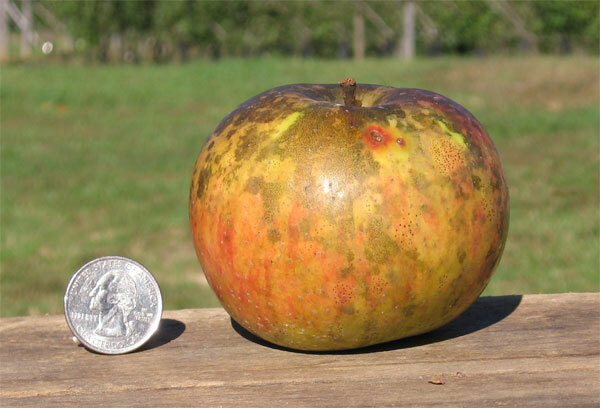 In 1915, the Rhode Island Greening was the fifth leading commercial apple in the USA, but the Northwest Greening was also widely grown in Pennsylvania. Dad's description of the apple fit both greenings. The tree was vigorous and a reliable cropper. The fruits were variable in size, but could be quite large. They were smooth-skinned, greenish-yellow, and excellent keepers. Tart, although mildly so, the Greenings were almost exclusively cooking apples. They were versatile. They could be used in applesauce and were second only to the Northern Spy for pies. A very flavorful apple and a favorite for those who wanted a sweet apple with little tartness. The trees were bountiful and full of fruit. Some years, however, since the blossoms ripened pretty early, frost damage meant they didn't get a crop. Although favored for fresh eating, some customers liked Grimes for sauces and pies, because even though sweet, its rich flavor didn't bake out like some other sweet apples. They kept well, except for a tendency for the skin to shrivel after too many weeks in storage. Tart in flavor, they were considered mostly for fresh eating. Perhaps because they were small, they were not good sellers. Since Jonathans bruised easily and didn't store well, they weren't kept in the apple cave. My Grandpap used them in a special way. They were the apples he was willing to hand out to kids while he was on his milk route to Iselin, a nearby company-owned mining town – especially during the Depression when Iselin was populated by the families of unemployed and underemployed coal miners. over yellow Both Dad's and Grandpap's favorite eating apple. It was large and richly flavored -- sweeter than the Baldwin, but with a good touch of tartness. The apple could get some members of the family in trouble because of its size. Dad's younger siblings couldn't finish a whole one, and Grandpap would get upset when he found half eaten apples lying around. The King was used for both fresh eating and cooking, but it was better for cooking when it not quite ripe. It ripened earlier than the Baldwin, but was not as good a keeper as the Baldwin. Dad remembered his father saying of the King that it was "the way an apple is supposed to taste." & yellow-white Because they were smaller in size and didn't keep long before turning mealy, they were not a top seller. They were one of the 14 varieties kept in the apple cave, but they weren't expected to last until spring. Although it was sold primarily as a fresh eating apple, it could be used for baking, as well. Dad remembers his mother saying, "If you bring me some Macs, I'll make some pies." Even if the McIntoshes tended to break down in texture in the baking, their flavor and aroma made up for it. My grandpap kept only a few Spy trees, in contrast to his cousin, Cree Hood, who swore by the Northern Spy and grew more of them than any other variety. Many customers considered the Spy the very best pie apple ("Spies for pies! "), so they had a prime location in the apple cave. What my grandpap didn't like about the Northern Spy was that it bruised too easily, and that was not good for either handling and keeping. He would remark that a high percentage of the Hoods' apples went to waste. Northern Spies were also more difficult to pick. Short stemmed, they had to be pulled off with a more elaborate twist. That short extra time per apple added up when picking many bushels. Greenish yellow. Sweeter than a Baldwin, good for fresh eating and baking, too. One of the first to ripen of the apples that were kept in the apple cave. They sold as well as any in the earlier part of the season, even though they were not especially attractive. Dad also remembered that it was recommended that Pippins be allowed to mellow for a few weeks for them to be at their best. Dad only remembered Pippins being called just that, but based on its color and season and the popularity of the apple back then, I think it was certainly the Fall Pippin. Remembered fondly because it was one of the first apples to ripen in the summer, but it was strictly for home use. Highly flavored. Like other early apples, my grandmother used them for applesauce. Some apples must have kept long enough to overlap with the first of the pie apples, because my dad remembered that although his mother wouldn't make a pie of all Rambos, she liked to add some to give a pie extra flavor. Although Dad called the apple the Rambo, I think because of its season it was a Summer Rambo, not another variety usually just called Rambo, but occasionally Winter Rambo. Both are very old apple varieties. The Summer Rambo, or Rambour d'Ete, is said to have originated in the village of Rambures in the Somme department in the region of Picardy, not far from the English Channel. The other Rambo was introduced before 1700 and possibly as early as 1640 by either Peter Gunnarsson Rambo, one of the original settlers of New Sweden, or one of his children or grandchildren. Since there is no written record of the variety before 1817, there is no way of telling. There is a record that Peter Gunnarsson Rambo brought fruit and garden seeds with him in a box, and from one of those seeds could have grown the first Rambo. I am related to Peter Gunnarsson Rambo through my father's mother's side of the family [The only reason for this digression]. Beauty does have its own rewards. My grandpap liked to set out the Rome Beauty apples for display. Being large, bright red, and often perfectly round in shape, they attracted attention. That characterisic made them a good seller, even though they were only average for either fresh eating or cooking. One very good quality that Grandpap appreciated was that the fruit didn't bruise easily and stored well. It still looked good and may have improved in quality in storage, so it was a particularly good seller in the spring. October Massachusetts before 1650 Medium. brown Excellent in cooking and gave cider an extra rich flavor, but Dad did not like it for eating fresh. I think what he didn't like was the texture of the leather coat. Dad praised it for keeping in storage not just very long, but very well. Dad only remembered it being called a russet, and when I tried to figure out which one, he said it had a reddish tinge to its russet coloring. That puzzled me, because the Roxbury and Golden Russets, the two most popular russet apples of the time, have a bronze blush that isn't normally called red. In 2014, I may have stumbled on an answer in our own orchard, since some of our Roxburys did indeed have some red on them. This was one of the best flavored apples for a kid, almost honey sweet, and very juicy. The apples were soft and not crunchy, and, unfortunately, quickly got mushy. Under the family's one Sheepnose tree could soon be seen lots of rotted drops. The tree grew near the house, so it must have been planted before the orchard was added. The shape of the fruit was elongated, so it did resemble a sheep's nose. Dad only knew it as Sheepnose, and based on his description, I am uncertain which of several varieties nicknamed Sheepnose it might have been. Neither the Black Gilliflower nor Yellow Bellflower are sweet early apples. The Chenango Strawberry is early and elongated, but is as sharp as it is sweet. The Sweet Bough was a commonly grown, large, early season apple in the nineteenth century known for its honeyed sweetness. In shape it was usually round or ovate, but it could be oblong conic (almost sheepnose shape), but I find no reference that Sheepnose was one of its synonyms. Dull red over yellow The Stark was a good apple, but neither exceptional in flavor nor appearance. Thick skinned, it was an excellent keeper and didn't bruise. Since the Hendersons were the only orchard growers in those parts with them, the Starks often won prizes at the county fair. It merited storage in the apple cave. Almost solid red Another great all purpose apple. The best apple in the minds of several customers. Both sweeter and tarter than the Baldwin, with a pleasant aroma, its flavor contrasts made it stand out. It was another of the preferred apples for cider. Although it was early to blossom, they were often the last trees to ripen, so some loyal customers had a long wait for them to go on sale. Since it was an excellent keeping apple, like many other of my grandpap's favorite apples, it could be sold over a long season. ripe Very juicy, with a good texture. Good all-purpose apples, they were mild in flavor. Since the fruit ripened sooner than the winter apples, the apple season only really got going when the Wealthies were ready. Although they have a reputation for being large, Dad remembered them as being smallish in size. 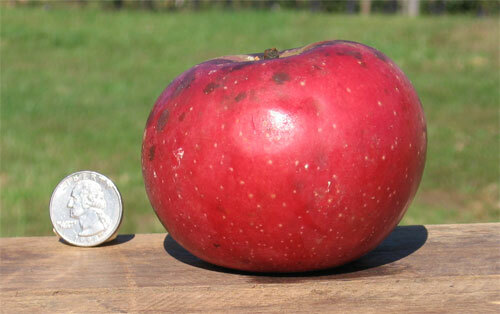 Competed well against the Pippin and Macintosh, but not the later ripening varieties. The trees were very hardy and could be counted on year after year. They were among the 14 varieties stored in the apple cave, even though they didn't keep as well. over yellow There was only one tree, big and tough, if not very handsome. It was part of the old orchard planted by my great grandfather. The huge size of the Wolf River apples would catch everyone's attention, but unfortunately it was pretty dry and flavorless. When cooked, it shriveled down to nothing. Another downside was that it didn't store well. Grandpap didn't sell them, but, because of their size and appearance, he placed a Wolf River as a novelty right on top each bushel he sold. Mother could enter Wolf Rivers at the Indiana County Fair and count on winning first prize, since at the fair, apples were judged for appearance, not culinary quality. Yellow green Beloved because it was the first apple to ripen each year. It was only fair to eat fresh, but when there are no other apples around, the taste was pretty good. Not sold, but used by the family. Used for applesauce by my grandmother rather than for baking. They were long gone by the time most other apples were first picked. Yellow with red stripes Another apple that was featured in display, although some were distinctly "lop-sided." It was another excellent keeper, and it didn't bruise. A few could be counted on to still be in decent shape to eat at Easter time. It stayed crisp over time. Dad remembered its flavor as a bit bland, but it had its loyal supporters. It was another apple that ripened late and needed time to mellow. Dad considered the Ben Davis a worthless apple. The apples were small, hard, dry, and tasteless. Its sole redeeming quality was its keeping quality. Dad used to tell a story about one of his uncles who bought a variety of bare-root trees from a peddler. After waiting five years for the trees to bear, he discovered they were not an assortment of commercial apples as had been claimed, but all Ben Davis. In disgust he pulled out every single tree by its roots. Dad remembers his mother speaking fondly of the Maiden Blush tree that grew near her house when she was growing up. The fruits were a very pretty creamy yellow with a blush of red on one side. However, none were grown in my Grandpap's orchard, probably because as summer apples they had a very short shelf life. I also got the idea that Grandpap might have thought the apple was prettier than it was good to eat. I think he considered the Maiden Blush to be a spitter, with a sharp tang and harsh astringency. The Smokehouse was another tree that grew by Dad's mother's father. Smokehouse apples were a good, sweet, and faintly spicy. Dad doesn't know why Grandpap didn't include them in the orchard. Dad spent his last years only a few miles from the town of Lampeter, where the tree was first discovered. It was growing near a farmer's smokehouse, hence the name. This page was created and is maintained by: John Henderson, Sage Hen Farm, Lodi, NY.